Opps! Fixed it now – cheers @Max! Thanks! Is there a solution, perhaps a macro, or code in SD, that can make this work? (like send current date to a field. Any recommendations appreciated; your site has been extremely helpful. Bonnie – erm, you can use [Today] in calculated default values – just not calculated fields, is that what you’re asking about? And I am trying to dynamically calculate start and end days of the month and creating dummy hidden columns in share point for using the calculated column of =(Today). Trouble is I do not think this date for start and end of month updates automatically at end of month. When I create the calculated date column the SP calculates the date for the current month but not the new month when it arrives. Even in existing records I need the value to update to the new month. Is there a way of doing this so it updates automatically. I noticed it gives the correct start and end date for new months but the old records still have the previous start and end of the month. Instead if you want to do filters like “Current Month”, “Previous Month” (which am assuming you’r doing from your post) then you have to turn the problem on its head – see this page for a solution – http://blog.pentalogic.net/2009/11/howto-filter-items-current-calendar-month-view-sharepoint/ – hope this helps. I am aware that this Today value cannot be used successfully in calculated columns hence the question, but I initially started designing with a sort of overall view that you could “get away with it”. I am new to SP so please excuse the lack of knowledge. I would like to also use this opportunity – before I go any further – to ask how I can make a list of dates (in date format) for a column on the SP list, I am currently using a look up. I think in all honesty I need to get this before I do anything because this is the main user field for date changes and so it is going to be hard to create a comparison with a string and a date value. Our list of dates is currently linked from Access and we cannot get the dates to display as a look up list in SP if we set the dates to a date/time field; the date/time field does not show in the ‘column to display’ when setting up the date list; we have to use text dates and that is no good for comparison. @Andrew – Ignore my grumpiness, just been trying to kill that ‘trick’ off for a while now! Date fields as a lookup list – why you would want to do that? Why not do them as “Date and Time” columns, is it because you need to limit the dates that the user can display? a) A better place for this question (assuming you’re on stack overflow above) is actually http://sharepoint.stackexchange.com/ as stackoverflow is just about solutions involving code – many ways to do things don’t use code and stack-overflow isn’t really the right place. b) Take a step back and explain as simply as you can what you’re wanting to do in broad terms (rather than at the moment which is half way down a certain path) – there may be a better way to do what you’re wanting to achieve but at the moment its hard to see past the details to the bigger picture. Let me know if you do post another Q! I’ve been trying to play around with the Today formula in Sharepoint for some time, however I’m still not having any luck, do you have a suggestion for the below? I currently have a column within my sharepoint site that lists dates that I received a request on. I’m looking to create a column that calculates how many days it’s been since that request date. Do you know how I can calculate a column to show how many days or even a view that would filter for requests that are active and over X days old? Here are some articles (and a product) that may be of use to you. The reason I mention Highlighter is because it would seem to match your requirements quite well; the Countdown (or Countup) option would allow you to show the number of days since the request was received. You could also add row highlighting for those that have been waiting for a long time. I am trying to create a list that uses approval workflow process. Problem: On the main list, I have 2 fields that shows when each approver have approved the request. How do I do this? Tried do to a reference using calculated field but it does not work. Specs: I am using a task list, workflow approval process step in Sharepoint 2007. Can anyboday tell me how to validate a column? My requirement is Date_of_join column should not be greater than today’s date. How to use the TODAY formula in windows sharepoint services 3.0. 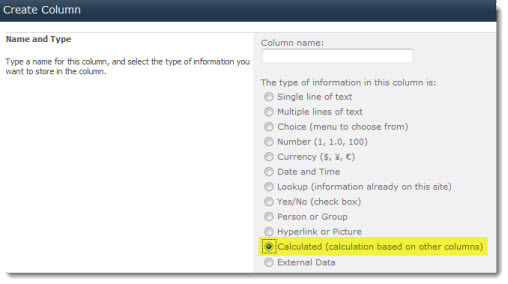 Mean In Date_of_Join column when entered tomorrow’s date it should not accept. Thank you. it save lot of my time.